Now we’re starting to see some major progress! My daughter’s room is really beginning to come together. We’re in the home stretch with just one week left now. All of the lighting was installed this week. 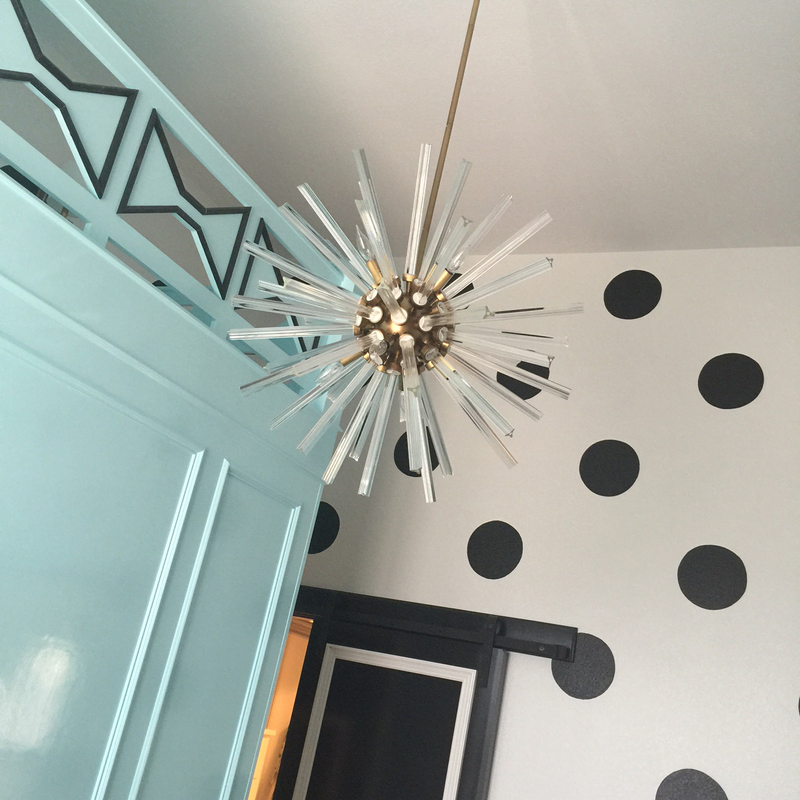 Our favorite fixture by far is the acrylic and brass sputnik chandelier that will hang over her day bed. This is a view from her top bunk looking down. 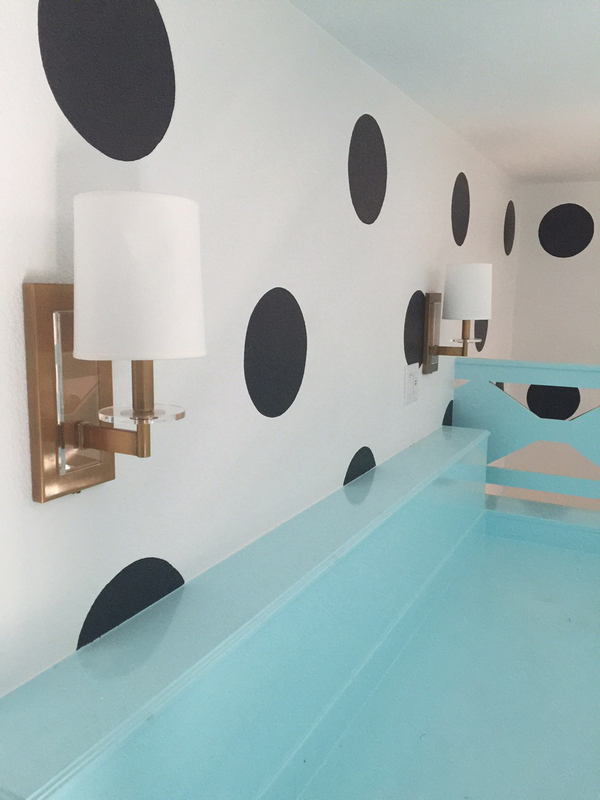 The polka dots on the four walls of her room were a last minute add on. 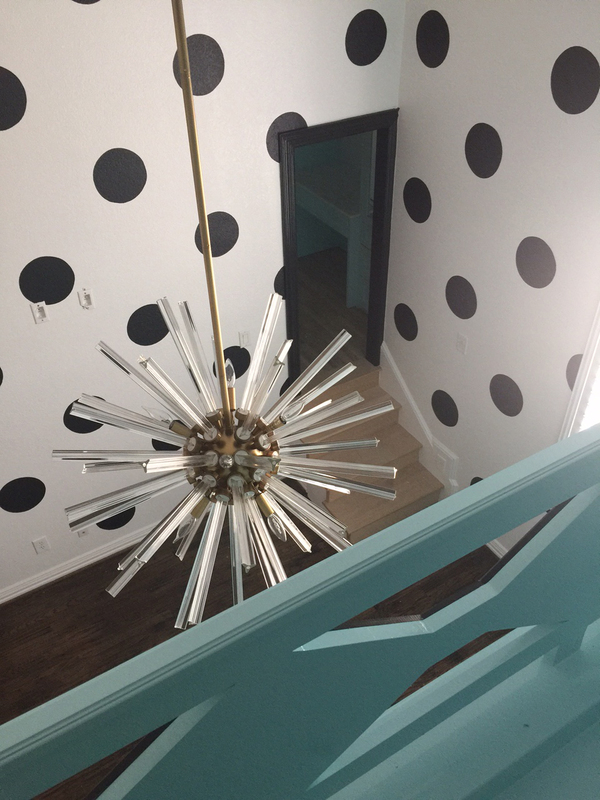 I kept thinking the walls needed something & decided the polka dots were the perfect way to go. 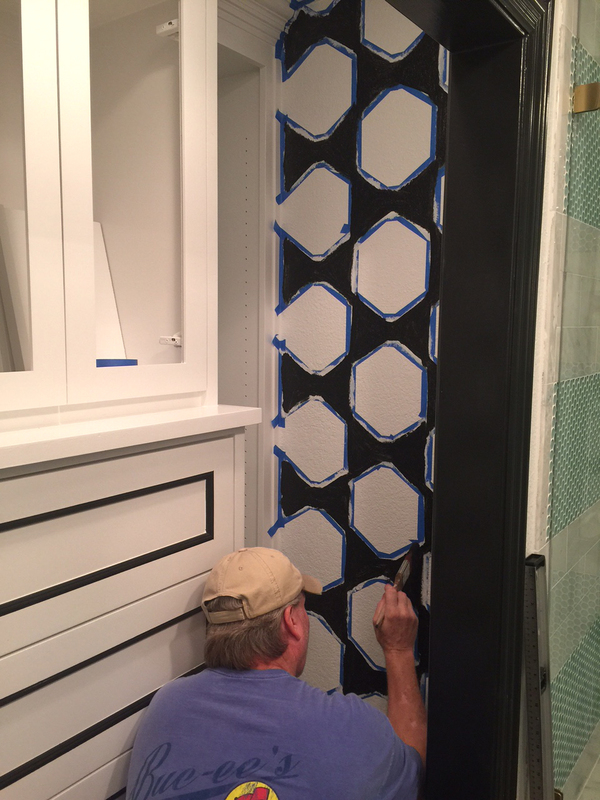 We couldn’t be more thrilled with how the large scaled pattern really takes the room’s design to the next level. The sconces on the top bunk were also installed this week. They will be perfect for when she’s reading at night before she goes to bed. 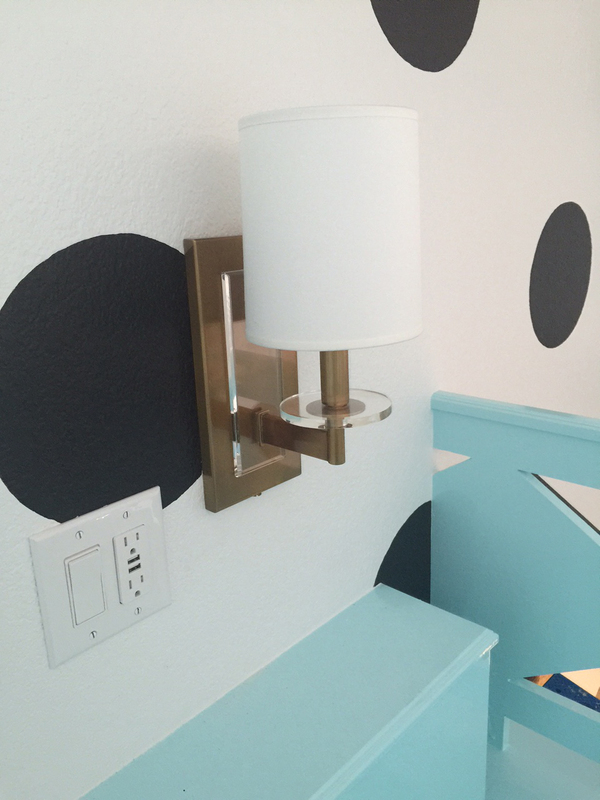 The switch to turn the sconces on & off is right by the head of her bunk. If you look closely, you’ll notice that the plugs we used have two electrical outlets and two USB outlets. I specify these outlets in all of my remodeling projects. They are so convenient and allow you to plug in electrical items and still have room to charge your phone or other devices. This view of the room shows more of the painting that was finished this week. 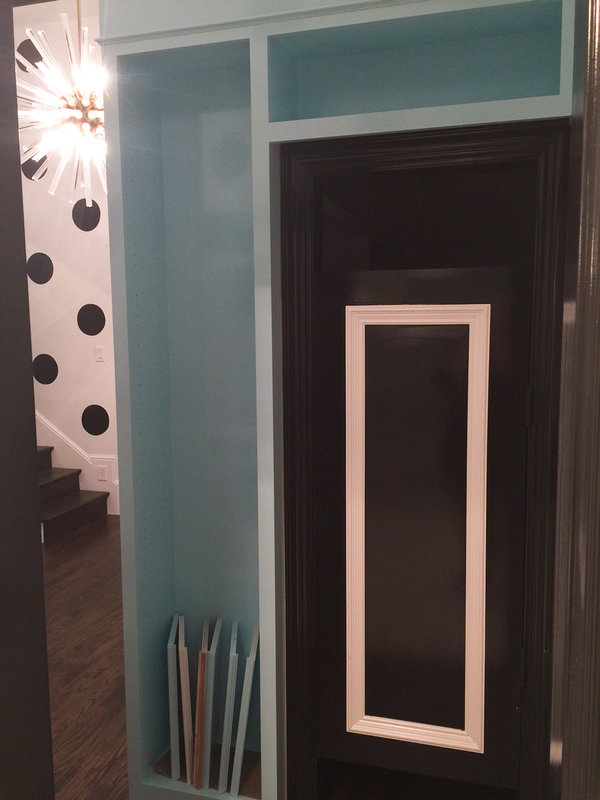 The cased openings & doors were painted in Benjamin Moore’s Jet Black with white trim on the doors. 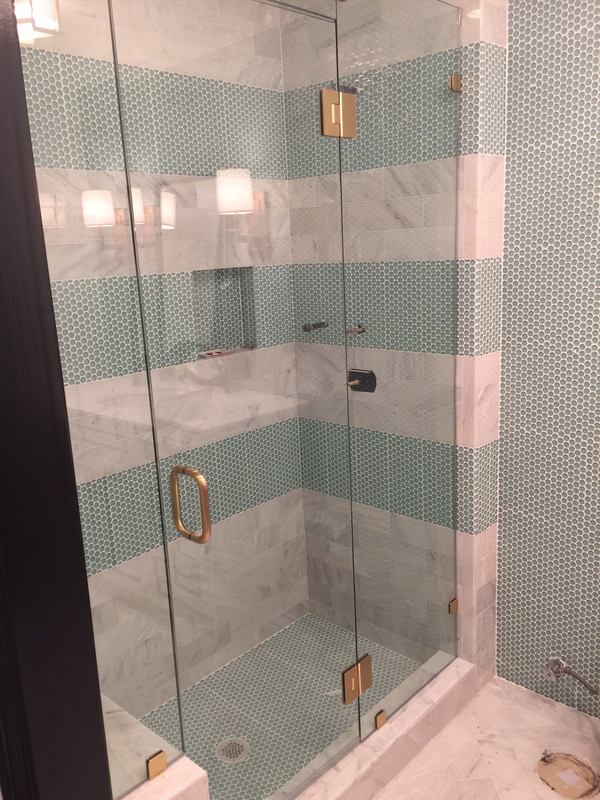 The frameless glass shower was also installed this week. 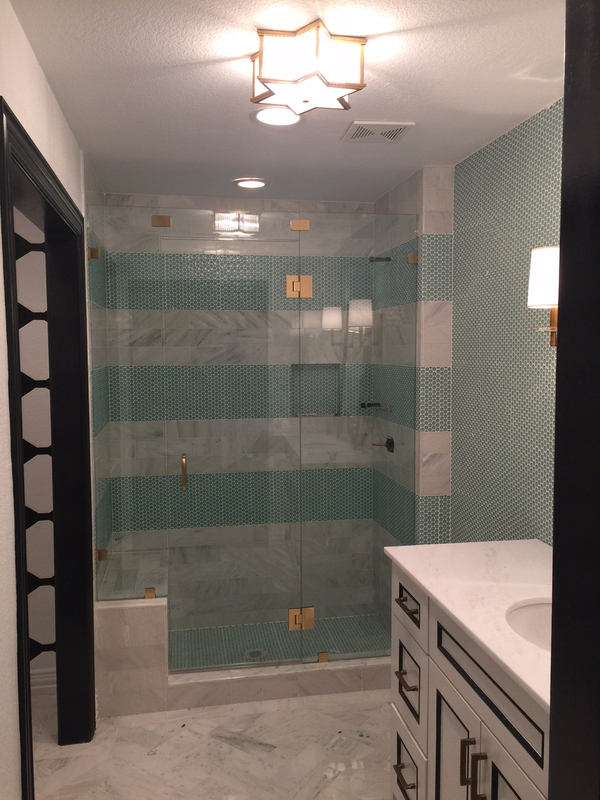 The brass fittings are the perfect compliment to the brass lighting & hardware in the room. I’m dying for the gorgeous Newport Brass plumbing to get installed. It’s supposed to arrive tomorrow. Fingers crossed! We’re really down to the wire! I love how all of the painting turned out in her bathroom. The black detailing on the cabinets is one of my favorite design elements. I picked up the bow motif in her shoe & accessory closet & had this pattern painted on the wall. I had the back of the shoe racks mirrored to open up the space. 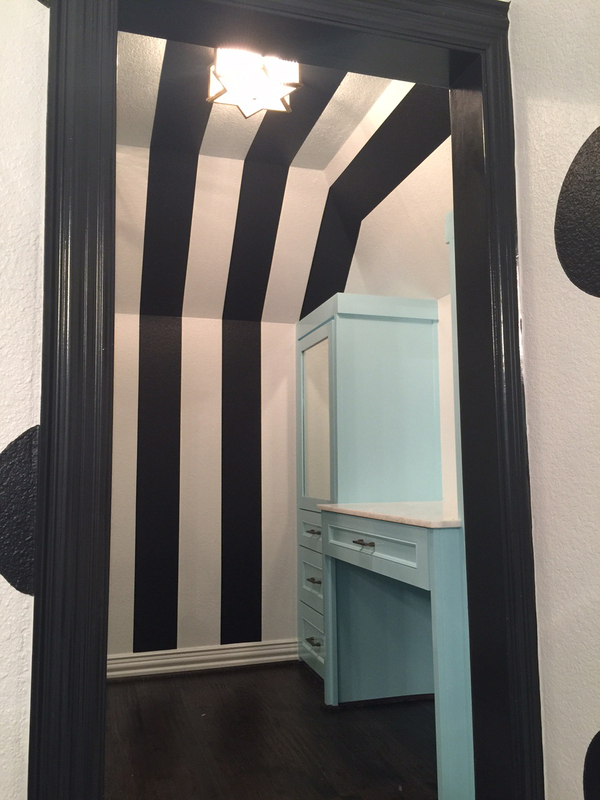 This was her originally tiny closet inside her bathroom. 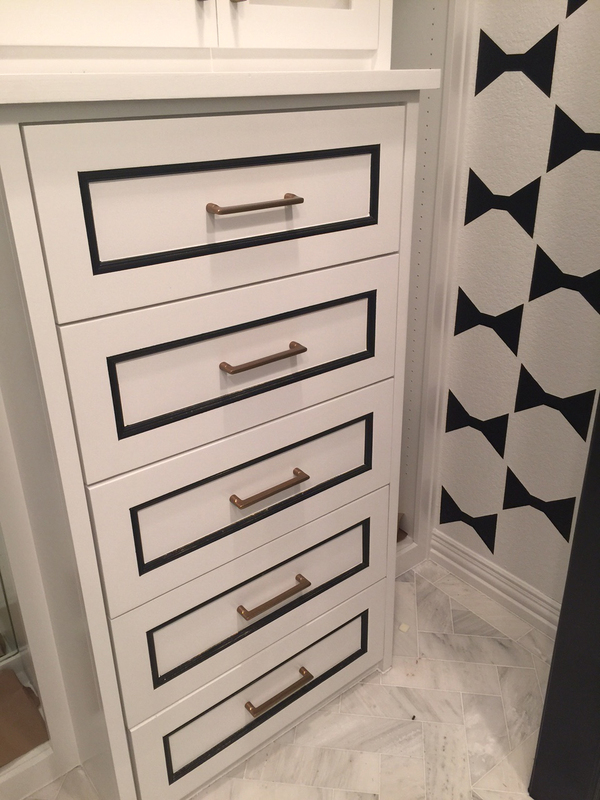 By taking off the door & adding the built ins for shoes, drawers for clothing & adjustable shelves for toiletries & towels, we’ve given her much more functional storage for her room. James Peck from Kidz Digz does work on so many of our projects. 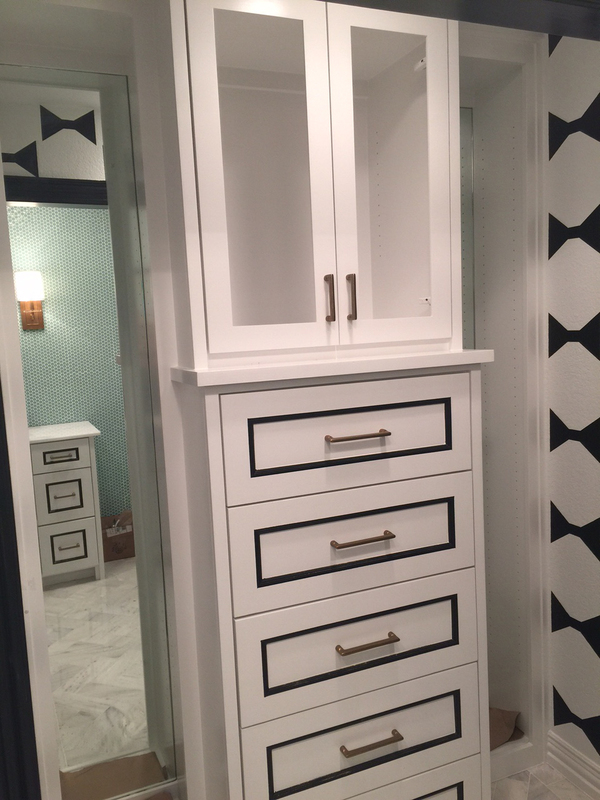 In fact IBB has worked with he and his wife for over 20 years on various murals, custom finishes & paint treatments and specialty finishes for cabinetry. The cabinetry hardware was installed today. I bought all of our hardware and plumbing from Nob Hill. My girl Jannette over there is a rock star! I use her for all of my client work. I must say that she really came thru for me this time. The original hardware I selected was backordered until December. She exhausted every resource & found these beauties. I actually love it even more than our original! Here’s a look at the dressing room door to the closet under her bunk. All of her hanging clothes will go in here. 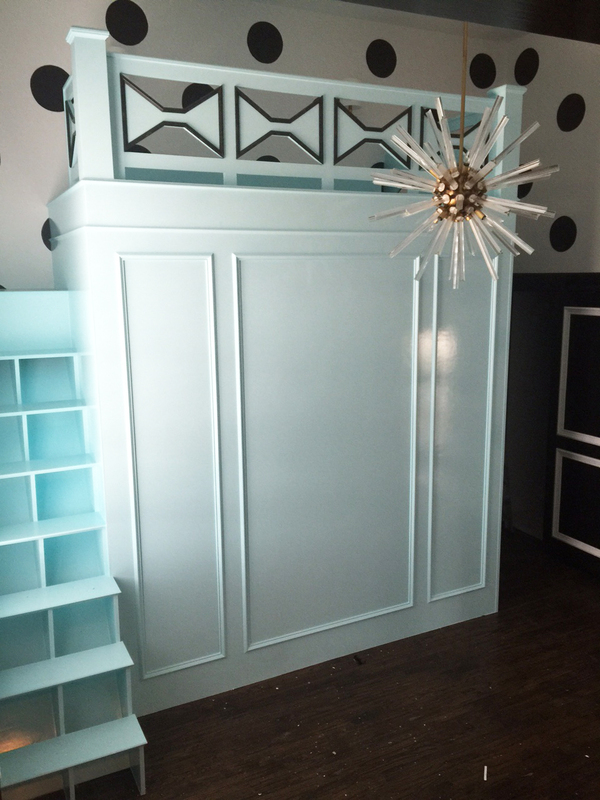 We’ll use the surrounding bookcase for her dance and school awards, her many books (she LOVES to read!) and mementos she has collected so far in life. We’ll also incorporate some accessories that she has selected to tie in her color palette and Kate Spade theme. Paint touch ups and the final clean will happen tomorrow. I’m installing her furniture, hanging art & mirrors this weekend. Guess what?! Remember how I was worried that her day bed wouldn’t make it on time? Well, IT’S HERE! YIPPEE!!!! CR Laine REALLY came thru & it so adorable! I’m really looking forward to showing it to you in the big reveal next week! I’m praying the plumbing goes in Friday or Saturday. 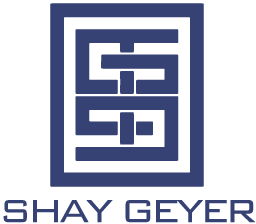 For sneak peeks and more design eye candy, make sure you’re following me on instagram. Make sure you check out everyone else’s progress in the One Room Challenge here as well.